THE trial of two men charged with the murder of police constable Stephen Carroll will open this morning (Monday) with evidence that undercover soldiers had been secretly bugging a car belonging to one of the accused for more than a month before the shooting. However, the court will also be told that potentially key evidence from the tracking device was destroyed while it was held inside a supposedly secure army compound just days after the murder. Forensic science will also come under the spotlight during the proceedings with a dispute over evidence about gunshot residue forming a central element. The trial is the latest in a series of high-profile Diplock hearings in recent months focused on paramilitary activity in Northern Ireland. A judge is to deliver his verdict in the next few weeks on the two men accused of the murders of two soldiers at Massereene army barracks. Forensic evidence, particularly a new form of DNA was central to the prosecution’s case in the six-week trial which concluded before Christmas. Meanwhile a mammoth trial is continuing of 14 men facing 97 charges of UVF crimes, including murder, on the word of two brothers who turned loyalist “supergrass”. Constable Stephen Carroll became the first member of the PSNI to be murdered when he was shot while responding to a 999 call in Craigavon shortly before 10pm on March 9, 2009. The killing came just 48 hours after the Massereene murders which were claimed by the Real IRA. Within days the PSNI arrested 17 year-old John Paul Wooton and former Sinn Fein councillor Brendan McConville in connection with the policeman’s murder. Both men were later charged with murder. Prosecution lawyers will allege that Wooton’s car was parked 150 yards from the scene of the shooting and had driven off within minutes of the killing. However a key part of the trial is expected to centre around McConville’s defence team’s argument that the residue found on the jacket did not come from the murder weapon. A key prosecution witness, identified only as `M’, is expected to give evidence stating that he saw McConville close to the scene of the shooting shortly before the attack. Prosecutors are expected to reveal how undercover soldiers from the British army’s Special Reconnaissance Regiment (SRR) had been covertly bugging Wooton’s car for a month before the shooting and had tracked its movements on the night of Constable Carroll’s murder. Defence lawyers are expected to raise concerns that data tracking the car’s movements three hours after the murder was mysteriously deleted from the device while it was being held in a supposedly secure army base. The first edition of The Detail revealed that the trial is expected to hear evidence from an undercover member of the SRR unit, identified only as `PIN 8625’. He will tell the court that two days after Constable Carroll’s murder he was ordered to go to Maydown PSNI station on the outskirts of Derry where the teenager’s car had been taken following his arrest. `PIN 8625’ recovered the tracking device and brought it back to SRR’s secret base. He will tell the court that he removed the bug from Wotton’s car and left it on a bench inside a high security area of the base while he went on six days leave. `PIN 8625’ will tell the court that when he returned he discovered that data from the tracking device, recorded three hours after the shooting, had been mysteriously wiped. The data relates to its movements from 1am three hours after the shooting until it was seized by police later that day. In his initial statement to police the undercover soldier claimed that the potentially incriminating evidence contained on the tracking device was allowed to sit unsecured on a bench inside the army base while he went on extended leave. 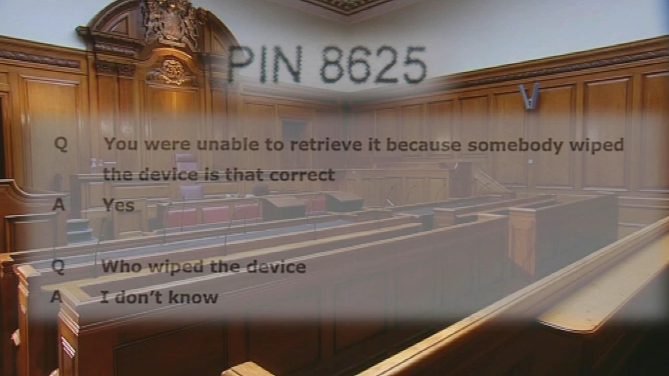 However when he gave evidence at a pre-trial hearing in May 2011, `PIN 8625’ claimed that only some data from the tracking device had been lost. “I was asked to look and see if the information was still there, which it wasn’t. Q: “So is it your evidence, is it, that all information up until the vehicle was taken by police was retrieved?